Forget everything you know about the yo-yo. This performer in Cirque du Soleil’s new show defies all logic. It goes down on a string, then (hopefully) comes back up. That’s it. World yo-yo champion Tomonari Ishiguro does things with the ancient toy that not only defies logic, it strains credibility. Known internationally simply as Black (a portion of his surname “black stone”), he is one of the featured performers in “Kurios: Cabinet of Curiosities,” the 35th production from Cirque du Soleil, the Canada-based group that revolutionized the very concept of circus entertainment. The show is currently under the big top at Dodger Stadium and runs through Feb. 7. Seeing Black at work, you’ll likely agree that he indeed can do just about anything with a yo-yo. Countless online videos are available, showing his prowess and sheer artistry. Many of his invented tricks are commonplace among yo-yo enthusiasts, and a few have become compulsory elements in international competitions. In “Kurios,” Black is one of the curios in a magical cabinet belonging to the Seeker, who is certain that there exists an alternate universe where the unbelievable and the amazing are real. 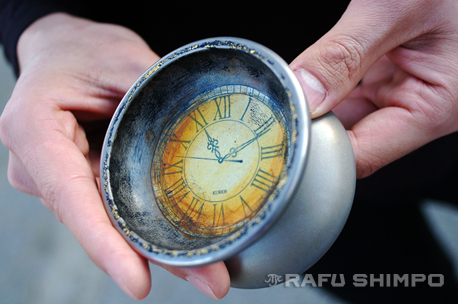 As the master of time, Black spins his pocket watches in all directions, speeding up and slowing down time at will. The show is the first Cirque du Soleil to have its artistic base in fact, rather than a fantasy world. The unmistakable trappings of the Industrial Revolution abound, giving the production a feel of the “steam punk” style. A native of Tokyo’s Itabashi Ward, a 14-year-old Ishiguro was among the legions of youngsters swept up in a boom in yo-yo popularity. It was at a Cirque du Soleil show in 2003 that Black began to look beyond the purely mechanical aspects of yo-yoing. In 2009, Black wowed Cirque du Soleil scouts with his talent, and after performing in several limited events, he was asked to join the cast of “Kurios” four years later. Many professional yo-yos are made of aluminum, but even that posed a weight problem for the size Black required for his act. His solution was to have a set of custom yo-yos custom made in Tottori, Japan, using a special magnesium alloy that provided superior durability but is far lighter than aluminum. 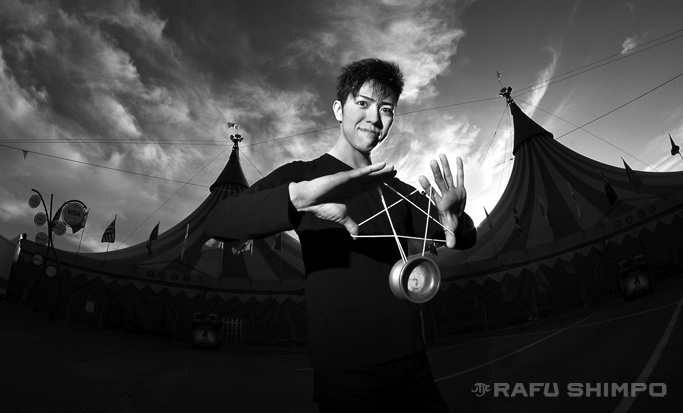 During the Rafu interview, he disassembled one of his performance yo-yos, showing how the butterfly sides, the bearings, the axle and string all fit together. “I’ve put all of my essence into building this yo-yo,” he said. Black’s passion has surpassed the boundaries of yo-yo-tricks. He has parlayed his motivation into helping others define their dreams and bring them to fruition. He has twice been asked to speak at TED (Technology, Entertainment, Design) conferences, global meetings created to further the spread of creative ideas. “I was asked to give a TED talk not because I’m a yo-yo champion,” he explained. “Most yo-yoers cannot make a living doing this. When I started, I thought I could help make the yo-yo world better. –Rafu staff writer Ichiro Shimizu contributed to this story. 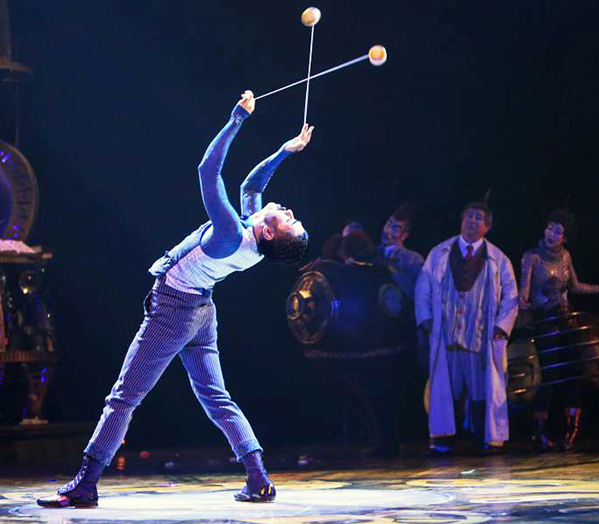 Cirque du Soleil’s “Kurios: Cabinet of Curiosities” performs under the big top at Dodger Stadium through Feb. 7. Tickets from $50 to $165 can be purchased online at cirquedusoleil.com/kurios or by calling (877) 924-7783.